"There's so much useful stuff here in this forum, at your site, Robert, and at Martin's site, on 19th-century ingredients, techniques, lore, etc, that one could put it all together and start systematically exploring all the old families of drinks--scaffas, flips, cobblers, daisies, sangarees, fixes, crustas, etc. etc. I've made a few here and there, but as we know every kind of drink has its secrets." That was over five years ago, and the post was made by excellent drink-writer David Wondrich. When no one grabbed this idea and ran with it, as it usually happens with these types of things, it was left to Dave. It was his idea after all. Today, it looks like more than five years of research and writing has paid off. Wondrich's new book Imbibe! is an excellent guide to classic cocktails as well as an homage to the the first celebrity bartender, Jerry Thomas. The book includes over 100 classic recipes from Jerry Thomas and his contemporaries. Before now, a problem with the oldest cocktail recipes has been one of interpretation. Different recipes used different measures and different terminology. Through exhaustive research, Wondrich has decoded and interpreted these classic recipes for the modern mixologist. All the recipes also include fascinating contextual information that explains their place in history and their cultural significance. Another interesting aspect of this book is a chapter called "Channeling the Professor - New Drinks From Sixteen of the Top Mixologists of Our Time." This chapter features, you guessed it, a collection of original recipes by some of the best mixologists and bartenders of today. The only rule was that the recipe be inspired by Jerry Thomas or his drinks. The diversity and creativity in these recipes is inspiring. This book is a must have for mixologists, bartenders, cocktail enthusiasts and history buffs. This book is good in so many ways. It's a great, fun read on it's own, the cocktail recipes are good, and even more interesting for the historical context provided. I'll include a drink here just to whet your appetite. I started with the original "Brandy, Gin, Santa Cruz, or Whiskey Fix" recipe. Fill a tumbler two-thirds full of shaved ice. Stir with a spoon and dress the top with fruit in season. 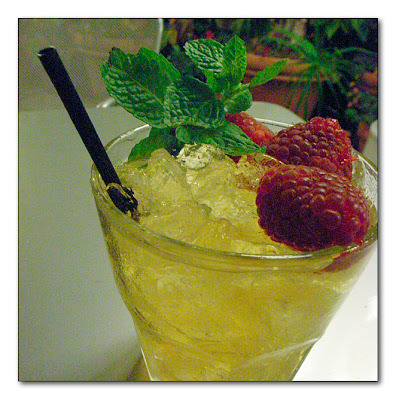 Build over crushed ice and garnish with fresh berries and a small sprig of mint. The simplicity of this classic recipe really shows off the complex flavors of the Mount Gay rums. The information in Dave Wondrich's book helped me pull it together perfectly. Go out and get this book today. It's a classic. See if you local bookseller has this book or get them to order it for you. Amazon also has some deals going where you can get this book along with Eric Felten's new book How's your Drink? (more on that one later) for a special price. Imbibe! From Absinthe Cocktail to Whiskey Smash, a Salute in Stories and Drinks to "Professor" Jerry Thomas, Pioneer of the American Bar.